Henry Clubb was a Chartist, vegetarian, utopian and politician. This is his life story. Henry Clubb’s claim to fame in the history of Chartism rests mainly with his longevity. When he died at the age of 94 in October 1921, he was, it is believed, the last surviving Chartist activist – his time as secretary to the Colchester National Charter Association now decades past. But Clubb’s long life was a truly remarkable one, encompassing decades of activism for the cause of vegetarianism, a disastrous bid to establish a utopian colony in the wilds of Kansas, front-line service in the American civil war, and even a spell as a Michigan state senator. Born on 21 June 1827, Henry Clubb became a clerk at Colchester Post Office at the age of 13, and would later claim to have become a vegetarian at about the same time after reading tracts on the subject. His family were members of the small Swedenborgian sect. In 1842, Clubb heard about a community called the Concordium which was experimenting with reformed education, gender relations, clothing, work and diet. He visited its base at Ham Common, Surrey and, after being interviewed by its founder William Oldham, became a member. The community was short-lived, but Clubb remained in London, learning Pitman shorthand (then being promoted as an aid to the “new age”) and becoming secretary to the leading vegetarian James Simpson and writing for the movement’s newspaper, the Vegetarian Advocate. Influenced by Simpson, Clubb also switched his religious allegiance to a vegetarian offshoot of the Swedenborgians known as Cowherdites or Bible Christians. Clubb appears to have returned to Colchester, where his family were involved in a “shorthand and vegetarian colony” at Stratford St Mary, working alongside his brother Robert Clubb, who was secretary of the local vegetarian society, and his sister Sarah Anne Clubb. By 1848, the young Henry Clubb had also become a Chartist. Professor Malcom Chase in Chartism: A New History, refers to him as having “welded the region’s Chartist localities and land plan branches into a single Essex and Suffolk Chartist Union”. His involvement must have been relatively short-lived. The following year he was elected president of a dietetic class at the Library Institution in Salford, and was making a living lecturing and writing on vegetarianism around the country. 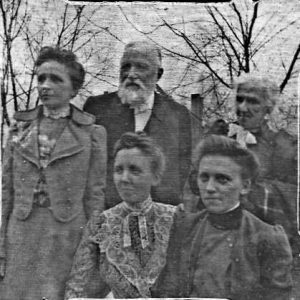 Henry Clubb pictured with his wife and daughters. Clubb emigrated to the United States around 1853, making his name in New York writing on the anti-slavery cause – a key issue at the time during the passing of the Kansas Nebraska Bill, which formally established the two territories as states of the union. In 1856, he founded and became secretary to the Vegetarian Kansas Emigration Company, which aimed to establish a colony based on principles of vegetarianism, anti-slavery, communal living and abstinence from alcohol. Although the original intention had been to restrict commune membership to vegetarians only, this was abandoned under pressure from investors who wanted a more widely based and sustainable community. The result was a plan to build Octagon City which would feature an octagonal town square from which eight roads would radiate. Between the roads, in four square miles, 64 families would build octagonal farmhouses with octagonal barns. But when the first 100 settlers arrived in May 1856, they found only one log cabin, one plow and dozens of tents. Mosquitos, a flu-like illness ascribed to malnutrition, constant thunderstorms and raids by pro-slavery activists combined to make the entire experience utterly miserable. By 1857 only four original residents were left and the site was abandoned. Clubb returned to journalism and the abolitionist cause. When the civil war broke out, Clubb joined the Union army and was sent to the front as a quartermaster, refusing to carry arms through conscientious objection. His wife Anne and family joined him on campaign and the whole family was present at the siege of Vicksburg. Two of their children died there, while Henry Clubb himself was struck by a bullet, the impact of which was absorbed by a leather purse filled with money. After the war, the family settled in Grand Haven, Michigan, where Henry Clubb edited a newspaper and represented the town in the state senate. He later became pastor of the Bible Christian Church in Philadelphia. Clubb remained active in the vegetarian cause, serving as president of the American Vegetarian Society and editor of its journal. But he also kept in touch with the British vegetarian movement, and in 1901 returned briefly to England. His death at the age of 94 some two decades later broke a final link with the age of Chartism. 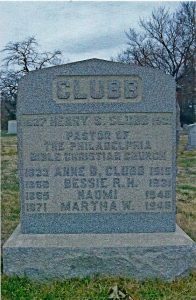 He is buried with his wife and three daughters at Oakwood Cemetery, Philadelphia. I am grateful to Michael Clubb for his permission to reproduce the photographs on this page.